DS360-A is a microdesoldering iron for thin desoldering jobs of SMD or conventional components. It is capable to provide up to 40 W, if it is required. 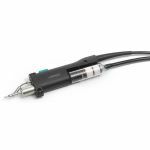 Choose a JBC Tools DS360-A Desoldering Handpiece Soldering Iron Today.